THE camping season arrived at last in July! 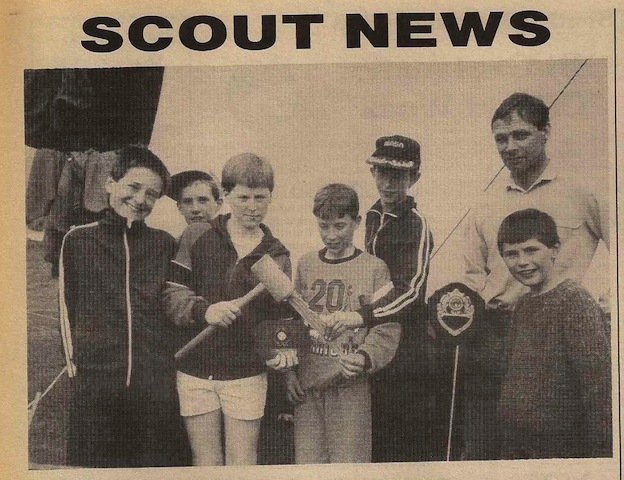 Five lads from the Troop, led by P. L. Simon Forshaw, entered in the District Camping Competition held at Fiskerton. By hard work, they came first in the Junior section and a worthy third in the Senior one - a marvelous achievement for their first attempt. The Father and Son Camp held at Sherbrooke campsite, was the scene of another notable victory. Scout leader Elmore and his son, Tom, a member of the Kestrel Cub Pack, took part in 2 days of assorted sports and skill. After demonstrating their prowess at casting, stilt walking, BMX riding and building an aeroplane, they won the shield as overall winners. John Carby, Nick Charlesworth and Ben Brooksby have been invested as Scouts. Stephen and Simon Forshaw have gained their Pathfinder badge. 25 lads, leaders, wives and entourage set off for the annual Scout Summer Camp held this year at Rydal Hall in the Lake District. Amongst the camp activities was an overnight hike in the hills, camping at Grisedale Tarn. Every member of the Troop, and two daughters of leaders successfully completed the walk which meant carrying everything they would need on their backs. There were some sore shoulders that night but Helvellyn had been conquered! Every Troop member also had a go Canadien Canoeing, thinly disguised as Red Indians, and led by Big Chief Baloo Cooling, on loan from the Kestral Cub Pack for a week. As usual, camp ended with its array of awards; Tim Clough won the Hairnet award for his liberal use of hair gel; Matthew Winson earned the Whispering award since he never seemed to be without his throat pastels; leader Vernon Evans was given the Foghorn award for the loudest voice on camp (he annually qualifies for this!) and Skip Stuart Elmore was given a walking stick in the hope that it might improve his progression down a mountain in future years! As in previous years, the running of the camp was greatly helped by many people not actually leaders, and particular thanks should go to Sue Evans for minding the food and balancing the accounts, and to Messers Forshaw and Hunt who did a sterling job of driving a heavily laden van to and from the campsite. By the time you read this article, our new Headquarters will have been officially opened - watch this space next month. However, we still have some way to go towards completing the projects. To this end the Group is running a '100' Club with cash prizes drawn every month. The odds are good. Why not give it a go? If you feel luck could be on your side, please contact Keith Stedman for details. Pic caption: Competition Success - the Stag Patrol winners of the Junior Camping Trophy, with Stuart and Tom Elmore, the best Lad and Dad team.